AROSPEED performance stainless steel brake hoses are manufactured from stainless steel braided Teflon hose with a PVC cover which corrosion and flame resistant. It also offers protection against abrasion. 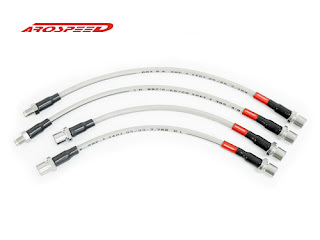 AROSPEED Steel Braided Brake Hoses will not expand under high pressure (volumetric expansion) and temperature, this allows a consistent line pressure giving a firmer and more efficient brake system operation, eliminating that‘spongy’pedal feel. This more efficient brake operation will lead to a reduced braking distance during a panic (hard) stop. Steel jacket provide corrosion and flame resistance. Stable performance regardless of pressure and temperature change. Eliminate spongy pedal feel when perform braking operation. High Quality braided hose with aluminum holder(Depends car model).